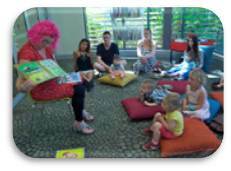 The Library is happy to present Storytime and Baby Bounce for the enjoyment of you and your children. This free service provides an opportunity for your children who are not already attending primary school to listen to stories, sing songs and do craft activities in a group environment at Storytime and share singing, rhymes, music and books with your babies at Baby Bounce. The Ten Minutes a Day program is incorporated into Baby Bounce. All parents, grandparents, carers and their little ones are invited to participate in these free programs. Storytime is a happy, enjoyable shared experience for you and your child. With your help we can develop and nurture your child’s love of books and the library. Importantly, it also helps children develop the skills they will need to learn to read and write and gives them an opportunity to practice listening and group participation skills. It is hoped that a child’s Storytime experience will begin many years of happy reading and help your child get to know their local library. Storytime can assist your child to develop a lifelong love of books, storytelling and the library. Baby Bounce is a 20-30 minute session designed to introduce your baby, and reintroduce you, to the joy of sharing the rhythm and rhyme of nursery rhymes, finger plays, poems and songs with your baby. Each session involves singing, clapping, musical instruments, rhymes and lots and lots of fun with your baby. Toddler Time is a 30 minute program for busy toddlers who are on the go. Action songs, board books and lots of interactive play - inventive and stimulating ways to encourage a love of reading from an early age. **The library offers Baby Bounce Packs for you to borrow which include board books, rhymes and songs to share with your children at home as well as board books, picture books, music and rhyme CDs, parenting books and resources and more. Some are available to download for free from the library as audiobooks or ebooks.